If you are a little ambivalent about debt, you’re not alone. Most of us like to use credit, but hate it when the bills come due. Sometimes debt problems are self inflicted and other times it’s due to circumstances beyond our control, whatever the reasons if you are experiencing sleepless nights, headaches, stomach aches and anxiety due to debt, then you’re laboring under the dark cloud called debt stress. Here’s the old saying “take control of your debt, don’t let your debt take control of you”. People who are feeling stress due to debt are feeling stress because their financial situation is out of control. They start to worry and fear and don’t know what to do. You know your situation isn’t good, or you wouldn’t be stressed, but just how bad is it? It’s time to know where you stand. Gather up your bills and make a list. You’ll have fixed expenses and miscellaneous expenditures. Write down each individual expense, then on the other side of the paper write down your income; the initial shock of reality can be frightening, but this is the first step in taking back control of your finances. Your second step will be to formulate a plan to attack your debt. There are only two ways to do this. First, you have to look at your expenses. Can you cut back on eating out? Can you get a cheaper cell phone calling plan? Can you reduce your cable service? Second, are there ways to increase your income? The obvious is to ask for a raise. The worse your employer can say is no. How about a little entrepreneurship? Are your work skills marketable for some part time freelancing? Investigate ways to take your hobby and make extra money from it. After this create a budget. Take your cash flow, income and expenses, and set your monthly or bi-weekly budget. For some it helps to align it with their pay schedule. We want you to refocus from the problem and focus on solutions. 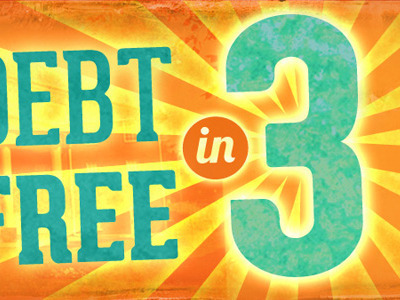 Listen, if you’ve been carrying a heavy weight of debt stress, it’s time to stop. Prolonged stress can only lead to even more trouble. Your self-esteem gets damaged, your energy gets zapped, your health can suffer, and to let debt do this to you is just not right. It’s time to let old baggage go. Yes, you may have spent too much. Ok, you had some unexpected emergencies and you never put money away in an emergency fund, but all that is history and you can’t change what was. Once you reconcile these facts with yourself, you will feel relief and the burden of stress will be lifted. Now, you need to take action and set a new path for financial freedom. Start with the suggestions we’ve outlined above, look for ways to reduce your expenses. This will be a learning experience you will never forget, and if you feel yourself reverting back to your old ways, remember how miserable life was being in debt stress – this should save you from any further debt traps.